Justinmind Brand New iPad UI Assets Library! Get your hands on our brand-new iPad UI kit, complete with all the core components UI/UX designers need to create awesome iPad assets and apps! iOS designers can create amazing experiences for iPad, but as in any design process, having great resources makes a big difference. So whether you’re a complete iPad app design n00b or just looking for better iOS UI assets, you can’t do without our new iPad UI kit. Complete with over 200 core iPad UI elements and ready-made screens, Justinmind’s iOS 9 UI kit for iPad is now available. Read on for kit details, plus some handy tips on how to get designing with it in Justinmind. What’s inside Justinmind’s iPad UI kit? Our iPad UI kit includes iPad-ready icons, ready-made content blocks and screens—including sign in and splash screens, navigation bubbles, maps and notifications. The kit comes pre-installed in Justinmind when you create a new iPad prototype. 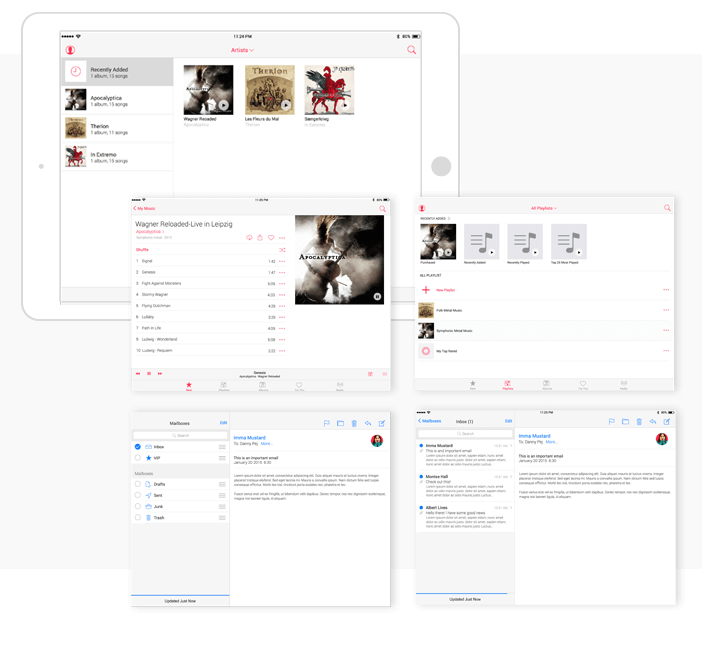 Kick-start your iOS app prototypes with our ready-made UI screens, built using tables and cells (instead of dynamic panels). This upgrade allows you to adjust any aspect of your prototype’s screens. You’ll be able to add, delete and customize individual UI elements and navigation components for beautiful and usable iPad assets. We’ve improved the structure and positioning of UI components in this library too! The 6 most-used components feature in the first window of the UI library, with a selection of screen examples, content blocks and dialogs that follow. Below this, you’ll find your basic content, including forms and controls, bars, menus, tabs and buttons. This will hopefully make for better visibility so that you don’t waste any time in prototyping! We’ve also added the Font Awesome library, an auto-scroll feature in palettes, and we have made some adjustments to improve performance. Follow the steps below to create iPad prototypes with Justinmind. To get started designing your iPad prototypes, download Justinmind and create an account. Justinmind offers a 30-day free trial, so take advantage of all our features! Many of you will create your designs for iPad screens using Adobe. While this is a great way to define screens, there’s no device shell to ensure your designs follow the shape of the iPad’s bezel. Justinmind’s device shell appears by default around the editing canvas and during simulation to keep your designs on track. You can also remove it if you prefer a minimalist workspace. To create your first iPad app screen, start dragging UI elements, such as bars, menus and content blocks, to the canvas. Watch your UI layout come together in no time. Remember, UI elements that can be individually customized to fit your app screen. Content blocks, dialogs, navigation bubbles and screen examples are made up of groups of UI elements and can be broken down and adjusted as needed. With Justinmind’s Events system, you can build out your iPad app’s functionality in no time. To add an interaction to a UI element, simply select it on the canvas and go to the Events palette (usually found to the right or below the canvas). Click “Add Event” to create a new event. In the dialog that appears, choose an event trigger and then an action. The event triggers recommended for iPad are similar to those used in mobile prototyping. For instance, an “On Tap” gesture will allow the user to trigger an event by tapping on the corresponding element on the screen during simulation. Justinmind has a wide selection of event actions to accompany your chose event trigger—including Show, Hide, Resize, Insert Into, Play Audio and Rotate. Our events pair perfectly with our iPad UI kit, allowing you to create seamless interactions and fluid navigation flows for your iPad apps. Designing for tablets, such as the iOS iPad, can be tricky. They’re neither desktop or mobile devices, and you should take this into consideration when designing. Navigation patterns, UI layouts and screen UI elements that might work for Mac or iPhone— if you haven’t already, check out our brand-new iPhone X device template and iOS UI kit—won’t necessarily match up on iPad. Luckily, Justinmind’s responsive design features make it quick and easy for you to design for iOS across devices. With the “%” size attribute (found in the Size section of the Properties palette) UI elements can be scaled proportionally and will adapt to different screen resolutions. Learn more about this here. Now you can design pixel perfect responsive designs across the board. And once you’re done designing, it’s time to simulate your iPad prototype to see it work in real-time. Show off your new designs to colleagues or even test them out with users. Easy! So what are you waiting for? Update Justinmind now and get down to designing amazing iPad assets and screens with our new iPad UI kit. If you aren’t yet using Justinmind, now is the perfect time to get on board!